Last winter, I shot the first film I’d ever produced: the short comedy Lovestuck, which is premiering this Sunday, March 19, at the Queens World Film Festival. Here are 11 things I learned throughout the process, from pre-production to the film’s premiere. Take promotional photos. Because one of the actors, Victoria Moyer, lives abroad, we only had a limited time to shoot the film while she was in town. It would have been difficult to fit in a photo shoot. But when it came time to put together a poster, I wished we’d had some professional photos taken. Our graphic designer did a great job with the screenshots we provided, but we certainly would have had more options with photos taken specifically for that purpose. Plus, promo photos would have been great for our IMDb page and social media posts. People hire people they know and trust to work on their films. It doesn’t matter if you’re making a no-budget short or a blockbuster movie; when you make a film, you have limited time and a limited budget, and you need to make sure the film gets completed. You’re probably going to think of people you’ve already worked with, people whose work you’ve seen, or even people you’ve met to fill available positions. I realized that if I was hesitant to take a chance on new people for my $500 short, that rule must apply more and more the bigger the project is. After making this film, I spent less time blindly applying for acting roles online and more time meeting other filmmakers at festivals. Allot time for other responsibilities in the production if you have them. Along with producing Lovestuck, I also wrote and acted in it. We didn’t have any time to rehearse before shooting, partly because the other actor had only just gotten to the city, and partly because I was spending so much time organizing everything—producing was new to me, and I had a lot to learn. The next time I act, write and produce, I will make sure to set aside time to have a table read to workshop the screenplay and time to rehearse with my fellow cast members. Ask for donations. 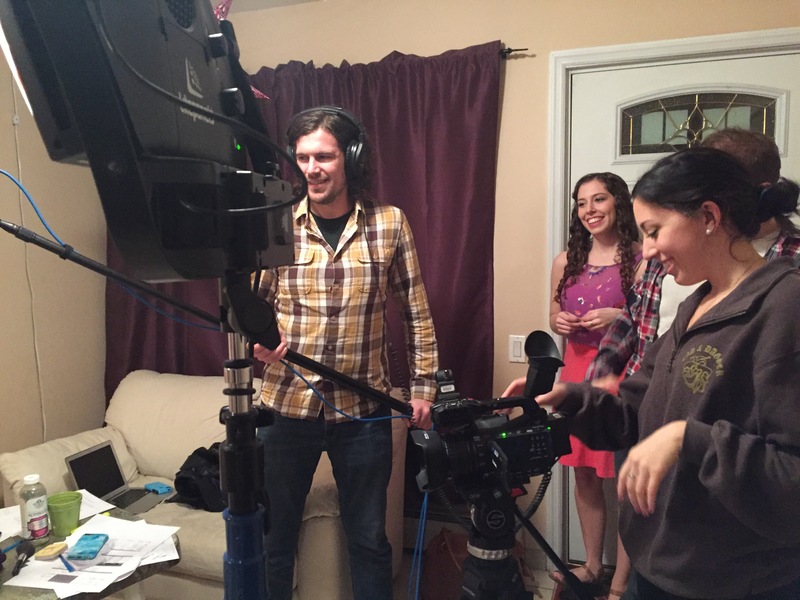 My fellow producer for Lovestuck, Elizabeth Patterson, had recently worked as a production assistant on a low-budget feature. She taught me that asking for donations can really work. For Lovestuck, she asked a local bagel shop if they’d be willing to donate day-old bagels to the production, and they kindly gave us more bagels and cream cheese than we could eat! You never know who will say yes if you just ask. Storyboarding and scheduling is key, even when your film is only a few minutes long. 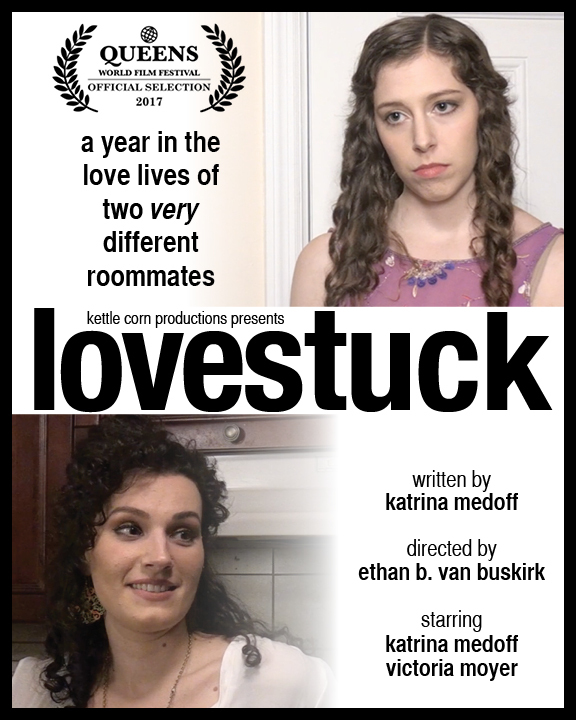 Lovestuck is less than five and a half minutes long, but we had eight scenes to shoot. We also had to make set, costume, hair and makeup changes between each scene. Thankfully, our cinematographer, my sister Valerie Medoff, had storyboarded the entire film, so she and the director, Ethan Van Buskirk, knew exactly which shots we needed. Valerie, Elizabeth and I were able to come up with a shooting schedule that allowed more time than we thought we’d need. We finished the shoot significantly before our scheduled wrap time. The best way to learn is by doing. Make a film before you’re ready, or you’ll never be ready. I learned a lot on the technical side during the Lovestuck We didn’t know about the “zebra stripes” function on the camera that showed if the footage was overexposed, so some of our footage was a bit washed out and impossible to fix completely in color correction. Without our production sound mixer (Mike Sayre, also our composer), we would not have known to unplug the refrigerator and would have ended up with terrible sound. We also noticed how light-colored clothes against our pale skin and a pale pink background washed us out; changing into darker or more colorful costumes worked wonders. The more you learn on one film shoot, the more prepared you’ll be for the next one! Shoot more B roll. We shot the entire film in one apartment, so there weren’t many great B roll options. But that also meant that our editor didn’t have enough to work with when putting together the opening credits. Taking more B roll than we thought we needed would have helped a lot. You’ll never wish you took fewer behind-the-scenes shots. Our PA/set dresser Tracy Sayre took tons of behind-the-scenes photos for us, which was great because you can never go back and take more. The photos are useful for promotional purposes and for the websites of everyone who worked on the film. How to communicate with a composer. This was the first time I’d ever worked with a composer who was creating a score for a film. Since I sing, I have some music vocabulary, but I had no idea what type of sound I was even looking for. Our composer, Mike Sayre, suggested that I listen to a lot of film scores and pick out what I liked and didn’t like. Then, the editor and I created a Spotify playlist with music similar to what we were hoping for to share with the composer. Set aside a budget for film festival submissions. The cost of submitting to film festivals adds up quickly. Make sure you have a budget for that part of the process. After all, when you make a film, you want people to see the fruits of your labor. It’s not that hard—just do it! Before making Lovestuck, I had acted in shorts with 20 times our budget; I thought I’d never be able to make something with my own money. 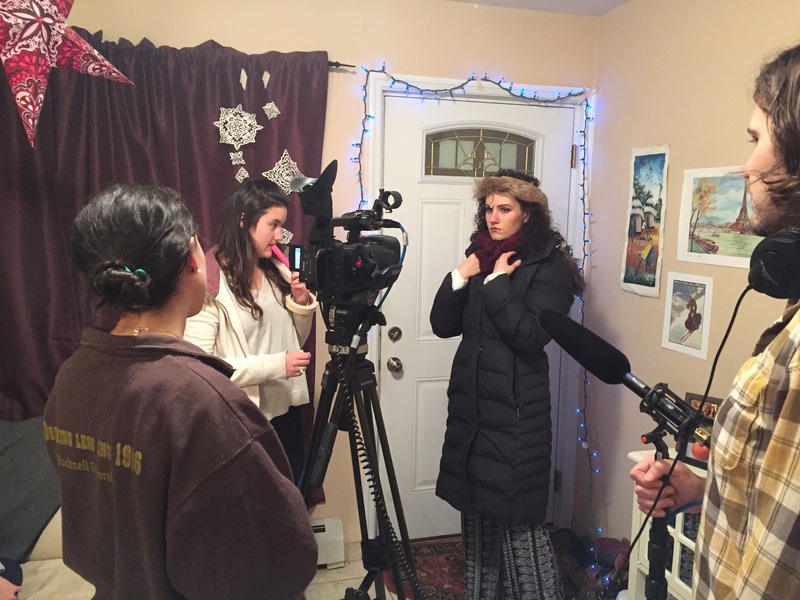 But after getting a cast and crew together, asking other low-budget filmmakers for recommendations of what equipment we’d need, renting a couple hundred dollars’ worth of equipment, and planning for a jam-packed shoot, we were able to shoot all of the footage we needed. As we headed into post-production and later into the film fest submission process, I realized that while there was a steep learning curve, it hadn’t been as hard as I thought it would be to produce a film. And now I have the confidence to produce more films and the knowledge that my team and I are able to bring a project to completion. So don’t make excuses or wait until you have more money, time, or whatever it is that’s stopping you. Just make the film! Click here for tickets to Lovestuck and other short films in the Queens Corner film block at the Queens World Film Festival on Sunday, March 19. It was so much fun working on this project! As a first time producer, I agree 100% with this advice. Especially #6! Such great advice – thanks for this awesome post. I particularly appreciated MORE behind-the-scenes shots & b-roll – your editors and promoters will thank you! Mellini Kantayya shares the books about mindfulness, presence and intention that can inform the acting and audition process. British-American actress and producer Ida Lupino, got her start directing when the director of the 1949 film Not Wanted suffered a heart attack during pre-production. Lupino stepped in and shot the film guerilla style to keep the movie on budget and on schedule. Budgeted at just over $150,000, the film grossed $1 million, and Lupino’s reputation spread through Hollywood studios even though the original director retained credit.